We’ve all seen ‘em. We’ve all sat through ‘em. Chances are, you’ve had to build ‘em. They are the bane of our existence, but a necessary evil to making sales calls, kicking off new initiatives, or reporting progress on projects. They are the much-dreaded PowerPoint presentation. Let’s face it—creating presentations that are exciting and engaging is difficult, if not impossible, and depending upon the subject matter. While it is hard to appeal to everyone in the room and grab their full attention, remembering these techniques can help you build a better, more powerful presentation. Step 1: Cause a commotion without all the motion. For several years users have revolted against Microsoft PowerPoint, the de-facto standard in presentation software. Whether this is because of its ubiquity throughout the business world; its limitations; or because people’s attention spans are drawn to whatever is new and shiny, is anyone’s guess. People have grown accustomed to hating PowerPoint. I think that this has more to do with the ways in which people are using it, not with the product itself. Recently, a lot of our clients have been asking us about Prezi, a web-based tool that incorporates animation and motion to deliver a presentation. Besides having a subscription-based pricing model in which you have to rent the software (which starts at $60 per year for basic use and is then priced per user for larger teams and unlimited use), the big issue with Prezi is that all of the presentations that I have seen look the same. It is hard to customize Prezi templates to brand guidelines, or insert background elements into the look and feel. The biggest complaint I have, however, is with the movement and animation that is incorporated into every transition—if on a large screen, motion sickness can (and does!) occur. People are using the flashiness of Prezi to substitute substance with visual effects. Step 2: Keep it simple, silly! Creating a powerful presentation depends on content that is clear, concise, and compelling to the audience. You should be able to make your presentation in thirty minutes or less, and by using fewer than 20 slides. 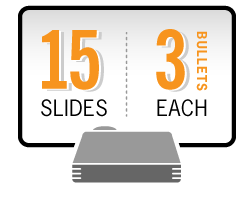 Each slide should not be overloaded with too much information; three to four talking points per slide (short phrases or sentences) will help direct the presentation and keep people’s attention. Using “rich media” in a presentation, whether graphics, stock images or illustrations, or even audio clips, can enhance viewer’s attentiveness to your presentation. Remember that brevity is essential: video clips should be no more than :20–:30 seconds in length, and audio the same length. Step 3: Keep them focused on you, not the screen. How many presentations have you been to where you ultimately found yourself checking email or social media feeds because you were bored out of your mind, or the presenter was not interesting? The best presentations are the ones that keep your audience engaged. One way to engage with your audience is to move around. Look people directly in the eyes, and don’t read directly from your slides. Simply preparing by reading through your talking points from each slide will help you know what to say, and when. Finally, avoid putting all of your content on each slide: viewers will simply read ahead and then tune out. You want them to be focused on you, not the screen. Step 4: Make it professional. The final part of a successful presentation is how it looks onscreen, and if it is consistent with your brand. To that end, be sure to use master slide templates that incorporate your logo, color palette, and other brand elements. Even graphics such as bar or pie charts should look like they are part of your brand. Animations and motion, while neat visual effects, are very distracting to a presentation. Instead of focusing on what you are saying, the audience may become mesmerized by what is going on behind you onscreen. The most complex animation that we use is “Appear,” which helps reveal talking points one by one, instead of all at once; guiding the discussion and preventing reading ahead. If all else fails, call in the professionals. Professional designers, in addition to creating background slide templates, are able to distill complex information into simple visuals that anyone can understand. They can clean up and modify those generic looking Excel pie charts into graphics that match your brand standards. And, by utilizing their experience with other types of clients’ presentations, designers are able to offer a unique perspective on your presentation. Previous Previous post: All that glitters…is good?